Searches will be conducted of both academic and grey literature by employing search strings that have been iteratively tested for comprehensiveness. Studies retrieved in the searches will be screened using pre-defined inclusion criteria and coded across a broad range of study characteristics. Inclusion criteria include, for example, type of business model employed, social, economic, and environmental impacts, and study design (e.g. generation of new empirical evidence). The outputs will be a database of included search results and a systematic map offering descriptive statistics and narrative assessment of the state of the evidence base in this topic. The confluence of the food and energy crises of the mid 2000s has revealed structural global issues related to long-term food and energy supplies and security [1, 2]. In the context of a rapidly growing global population, changing consumption patterns, finite fossil fuel supplies, and climate change, security of access to natural resources to produce essential goods such as food and energy is becoming an economic imperative [3–5]. Countries with insufficient supplies of natural resources, but with sufficient capital are therefore increasingly encouraged to secure access to these resources beyond national boundaries. As the geographies of supply and demand become more distinct, the private sector is increasingly positioning itself to capitalise on the trade opportunities this creates (e.g. by gaining control over upstream value chain activities). As a result, recent years have witnessed an unprecedented surge in demand for large areas of farmland for the production of food crops and biofuel feedstocks - especially in tropical developing countries, where fertile farmlands are comparatively cheap and abundant. However, because governments in most major investment destinations are ill equipped or are disinclined to adequately regulate farmland investments, in practice few sufficiently effective checks and balances are placed on land use change to plantation agriculture or forestry [6–8]. Evidence has shown that this could lead to a loss of biodiversity and forest cover [6, 9–11], in turn detracting from the potential contribution of, for example, biofuels to improving the carbon balance. Additionally, as a result of inadequate statutory protection of customary tenure systems, traditional livelihood activities could be displaced without adequate redress, which in turn could adversely impact on the food and income insecurity of vulnerable societal groups [12–14]. These issues raise questions about particularly the social and environmental viability of business models that produce raw material through large-scale plantations. Many of these investments, therefore, fail to adequately address the three pillars of sustainable development, namely economic growth, environmental stewardship, and social inclusion. Many argue that long-term global food and energy security challenges could also be addressed through more smallholder-oriented development pathways [15, 16]. This requires promotion of inclusive business models – seen here as business models that improve the livelihoods of low-income communities by integrating these into value chains as suppliers, employees, distributors, and consumers of goods and services . Within the upstream agricultural and forestry sector, this includes such models as joint ventures, management contracts, and tenant and contract farming schemes . Upstream business models are those business models applied to upstream value chain activities, which in this context involves cultivation of crops. The sustainability of such business models subsequently depends on their long-term economic viability and ability to assimilate green growth strategies (e.g. ‘climate-smart’ and ‘low emission’ agriculture). This topic is particularly relevant in light of global deregulation and liberalization processes that are increasingly relying on commodity markets to address global food and energy supply deficits and private sector investment to achieve poverty alleviation and green growth objectives [18–20]. Important questions, however, remain on the merits and demerits of the different dominant upstream business models. As noted by Kramer and Herrndorf , for example, while inclusiveness and green growth are mutually supporting objectives, in practice short-term trade-offs tend to generate tensions between inclusive and green business models. Some also warn that inclusive business models such as outgrower and tenant farming schemes could concentrate production risks with smallholders, engender land conflicts, and promote socio-economic differentiation [21, 22]. Furthermore there are positive examples of industrial plantations, which show that increased access to rural waged labor can contribute to female (economic) empowerment and benefit in particular the poorest, often landless, rural population . In some situations, there are also clear economic advantages to large farms; for example, due to their greater ability to spread risks, adapt to market changes, internalize new innovations, and benefit from economies of scale . 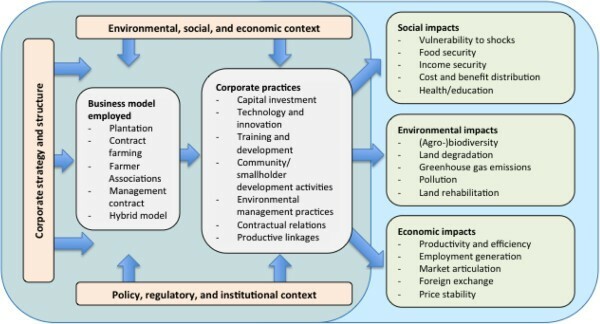 Therefore, in order to design appropriate policy interventions and promote a more evidence-based debate, there is an urgent need to systematically evaluate different upstream business models, the conditions under which these can contribute to sustainable development, and the extent to which certain business models consistently outperform others on different sustainability dimensions. This requires an improved understanding of the relationship between context, business models, and social, economic, and environmental outcomes, as conceptualized in Figure 1. Since the rural population is often highly heterogeneous and distribution of impacts uneven, this also requires disaggregation by stakeholder group. Conceptual framework for reviewing sustainability outcomes of upstream business models. For this review, we will produce a systematic map, which involves implementing a robust, repeatable, and transparent method for identifying and categorizing literature on broad research questions (such as this) . Like the systematic review, a systematic map uses a comprehensive search strategy and applies clearly stated a-priori criteria for inclusion or exclusion of literature located during the search [25, 26]. It however does not analyse, quantify and compare literature findings as is done in a Systematic Review, but rather describes the nature of the existing evidence base. This systematic map will identify and categorize empirical studies that have been conducted on the social, economic, and environmental outcomes of upstream business models within the agricultural and forestry sector. It will go on to highlight inter alia the extent to which these studies capture the conditions shaping each outcome, variations in outcomes between stakeholder groups, and differences across business models. Besides creating an overview of the state of the art, the systematic map also serves to identify potential knowledge gaps and specific sub-topics for which available literature warrants a systematic review. What types of sustainability impacts of different upstream business models in the agriculture and forestry sector have been documented in tropical developing countries? Deconstructed in Table 1. To what extent does the literature capture the conditions under which upstream business models impact on sustainable development? To what extent does the literature disaggregate outcomes by stakeholder group? To what extent does the literature compare outcomes between upstream business models? Since the current debate is focused largely on risks and opportunities related to (transboundary) investment flows to developing country agriculture and forestry, this mapping is interested only in ‘business models for investment’. This implies that it intends to catalogue only literature that relates to investments made directly by ‘corporate entities’ into the upstream production of raw materials, which can be private, public, or a combination of both. The entity would need to have a commercial orientation, where the primary objective is profit generation and relying on economies of scale and hired (as opposed to household) labour. However, it will not capture traditional public investments in, for example, input subsidies, extension services, or credit facilities. Methods used in the development of the systematic map are adapted from the Collaboration for Environmental Evidence (CEE) systematic review guidelines , other systematic map protocols [26–28], and the Social Care Institute for Excellence (SCIE) systematic mapping guidance [25, 29, 30]. The search will, for practical reasons, be conducted in English only. However, search results in other languages will be incorporated into the systematic map, using online translation tools where necessary. Appropriate search terms and strings were tested using ISI Web of Science and Scopus. Searches were developed iteratively, relying on number of search results and the inclusion of reference publications. A short-list of 12 publications providing empirical evidence on a topic relevant to the subject area were used to determine comprehensiveness of the search terms and strings (see Additional file 1 for publication list and results). Since some articles are available in full-text form within some publication databases and some only in abstract form, searches apply only to articles’ title, key words, and abstracts to prevent inconsistencies. The addition of more general exposure terms such as ‘company’, ‘investment’, and ‘corporation’ and prominent investment crops such as ‘oil palm’, ‘sugarcane’, and ‘rubber’ (based on number of hits). The addition of more specific outcome terms such as ‘deforestation’, ‘degradation’, ‘food security’, and ‘income’. Since it appeared that some articles failed to specify the types of outcomes researched in their abstracts, terms such as ‘impacts’, ‘implications’ and ‘effects’ were also included. The introduction of topical limiters. Where possible, searches are refined according to their research area; for example, ‘Agriculture’, ‘Environmental Sciences’ and ‘Geography’ are included, while ‘Cell Biology’ and ‘Computer Sciences’ are excluded. The testing revealed large numbers of results from unrelated research domains. The application of topical limiters significantly reduced this number, while continuing to capture the reference literature. The introduction of geographic limiters. An additional search string is used to confine results to ‘tropical developing countries’. This includes all countries located between the Tropic of Cancer and Tropic of Capricorn and classified as ‘developing’ by the International Monetary Fund (IMF). Although it would have been useful to document literature from other regions also, since almost 25,000 search results were returned in Scopus, the geographic scope needed to be refined in order to obtain a more manageable number of search results. Although the inclusion of these limiters may lead to the exclusion of relevant literature – for example, since some abstracts and keywords neglect to specify their geographic scope – no such cases could be identified through the testing of search strings. Table 2 provides an overview of the finalized search strings and the number of hits returned by Web of Science and Scopus for the different string combinations and with and without geographic and topical limiters. Additional file 2 provides an overview of the topical and geographic limiters that were applied in the testing of search terms and strings. These limiters will also be applied in the systematic map. The search will cover the four online search databases listed below. These best represent the research areas relevant to the research questions. All bibliographical details retrieved by the search strategy, including abstracts, will be exported to bibliographical software such as Endnote. Duplicate results will be removed. Since a large body of research is available as grey literature, the search will also utilize internet search engines. Applying modified search strings if necessary, the first 150 hits from each search engine (sorted by relevance) will be considered. A preliminary assessment of the comprehensiveness of the search strategy was conducted during the scoping exercise. The iterative process of adding different search terms and ensuring search strings captured the reference literature appears to have ensured a sufficiently comprehensive search strategy: the final search strings located all of the 12 reference articles used to test search comprehensiveness (Additional file 1). Although this has significantly widened the scope of the search and may lead to the inclusion of large numbers of irrelevant results, it will enhance the probability that most relevant articles are included. However, there is a risk that some studies are not adequately captured through conventional channels (e.g. conference proceedings, unpublished manuscripts, internal working papers). We will aim to identify these by using our established networks of academics and other stakeholders with expertise in the field and solicit inputs from experts through social media (e.g. Academia, Research Gate, Twitter, and LinkedIn). Dedicated searches will also be conducted to identify appropriate papers hosted on conference websites and academic theses hosted on university repositories. Relevant population: Studies should evaluate outcomes of business models on either the environment or on the human population within tropical developing countries. Relevant intervention/exposure: Studies will focus on one or more business models for investment in the agricultural, biofuel, and forestry sector in tropical developing countries. This will typically include, but may not be limited to, outgrower schemes, tenant farming schemes, nucleus-plasma schemes, farmer-owned businesses, joint ventures, management contracts, and plantations. Logging concessions will be excluded from the analysis since these involve extraction, not production of raw materials. Agricultural business models that do not directly involve corporate entities are not be the object of analysis, though may be used as a comparator. Relevant outcomes: Studies should evaluate the different business models against measures of ‘sustainability’. This ranges from economic (e.g. productivity and profitability gains) to social (e.g. equity, conflict, and wellbeing) and environmental indicators (e.g. deforestation, degradation, and pollution). Relevant study design: Studies should offer new empirical evidence, regardless of whether this is quantitative, qualitative, or mixed. Literature reviews, conceptualizations, and opinion pieces are excluded from the review, as are projections and scenario models. Relevant timeframe: In order to best capture contemporary processes and political and economic realities, studies should relate to interventions in the post-World War II era (1945 – 2014). This will, for example, exclude tenant farming schemes that dominated in feudalist and colonial societies. Studies will be assessed for inclusion through a multi-tiered process: first, on the basis of title, then by abstract, and finally by full-text review. If insufficient information is available to evaluate whether inclusion is warranted (for example, during the title assessment phase), then it is included for the next phase. Where full-texts are not available, authors will be contacted directly. The inclusion screening will be conducted by at least two reviewers that each will be responsible for their own set of literature. In order to test the consistency and objectivity of reviewer inclusion decisions, a Kappa analysis will first be conducted on 100 titles and abstracts, as per CEE (2013) guidelines. If a Kappa test returns a value lower than 0.6, reviewers will evaluate differences in the application of inclusion criteria and agree on corrective actions. The test will subsequently be conducted again, until an acceptable score is achieved. Any remaining disagreements over the relevance of articles will be resolved by a third reviewer. Studies read at the full-text stage but subsequently excluded will be recorded in supplementary materials, with the reasons for exclusion noted. Differences in outcomes may be observed due to the differences in research methods, temporal and spatial scales, socio-economic, cultural, environmental, and governance context, crop and sectoral focus, market-orientation, and land tenure systems, all of which will be coded for each study. This systematic map will not present full quality assessment. It will, however, code a number of indicators that will enable assessment of methodological rigor in the included studies, as is further detailed in the data extraction strategy (Table 3). Data from papers that remain following the inclusion and exclusion exercise will be extracted and coded, as per variables listed in Table 3. Data will be recorded in a Microsoft Excel spreadsheet. The spreadsheet will be divided into two sets – one will be a shortened version containing data from papers that are not accessible in full-text form and the other will contain data from full-text analysis. Data extraction will be undertaken by at least two reviewers and will involve a Kappa test (using the procedure detailed under ‘study inclusion criteria’). The systematic map will contain narrative and descriptive statistics, relating predominantly to quantity of relevant literature, by methods employed, geographic distribution, and types of interventions, outcomes, and populations analyzed. It will highlight the types of processes that shape sustainability outcomes, in line with the Conceptual Framework. It will also explore research gaps and topics warranting further systematic review (if any). A searchable Microsoft Access database of included full-text articles will be made available alongside the map. There are no potential competing interests. This systematic map is funded by CIFOR through the DFID KNOW-FOR programme. GS, PP, FM, FB, IJ, and ID conceived the research question. GS tested the search strings and drafted the manuscript. PP, FM, FB, IJ, and ID reviewed and commented on the manuscript. All authors read and approved the final manuscript.